and a choice of eight dining venues. and trips to Mayan archaeological sites. JW Marriott Cancun Resort & Spa invites groups to reach new peaks of productivity in the heart of Cancun, Mexico’s popular tourist playground. Near the resort, guests enjoy fishing, sailing, golf, and ancient ruins. Energized by the tropical sun and sea, they return to 373 guest rooms and 74 suites, each of which features private outdoor space with ocean views. The property also offers a Mayan-inspired spa, a wide choice of cuisine, and three heated outdoor pools, including a 14-foot dive pool with artificial reef. Events large and small set up in more than 23,000 square feet of indoor meeting facilities. The largest venue, the Tulum Ballroom, holds up to 1,800 participants, and its 14,262 square feet divide into eight breakout rooms. Also available are seven multipurpose rooms measuring up to 1,281 square feet and two boardrooms at 503 square feet each. All come with wireless internet access, the latest in audiovisual equipment, and professional planners to handle the logistics. Optional amenities range from walkie-talkies to TV production services. A complete onsite business center provides everything from secretarial support to computer workstations. Outdoor spaces host receptions for up to 2,000, all while taking full advantage of the beachfront locale. A footbridge connects the resort to its sister hotel, the Marriott Cancun Resort. 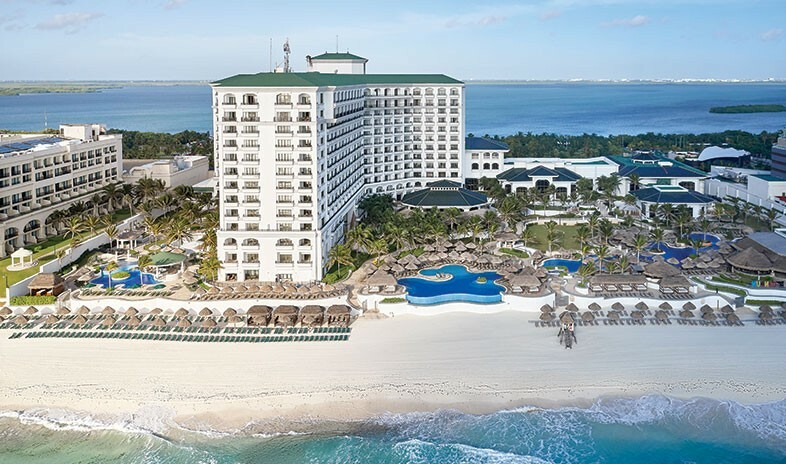 Together, the two properties are known as Marriott Cancun Collection and offer a total of 88,000 square feet of indoor and outdoor event space, along with 10 international restaurants. This is a beautiful resort and the service was excellent. The views were nice from the rooms as well. Plenty to do. I recently hosted 336 people at the lovely JW Marriott Cancun Resort & Spa and our trip was top notch and our guests loved the hotel. The Sales Incentive Trip was well handled by the hotel and our guests experienced the JW service I expected. I would bring a group to the JW Marriott Cancun Resort & Spa (or any other JW property) again, without a doubt. A great place for meeting if you're considering Cancun. They have it all. This is a great property. We had a few small issues with room assignments but other than that, the rooms, pools, and amenities were great! This was my first trip to Mexico so I was nervous about not speaking Spanish. Everyone that I came in contact with was so very nice and accommodating. I was blown away by the service they offered which made the event I was attending even more special. It was such a great experience that I wrote to the GM. The views and waterfront areas were also wonderful. Excellent property, management and service staff. Indeed upholds the JW tradition. Attendees were very pleased, from arrival to departure. Conf facilities were ok, we had breakouts, and some roooms were tight due to fitting a group in a room. Overall guest experience was great, the rooms, service were great, On site restaurants were a big hit, also having the Casa Magna next door adds another great property next door. Beautiful property. Conference Services Staff was attentative once I arrived at the property. However, it was different prior to my arrival as there seemed to be a lack of communication with the Conference Services Staff. Food was great; overall meeting experience at hotel was nice. These folks earn their ratings! This is a contemporary property with top-notch service. On-site Italian restaurant 'Gustino" is a must do. Easy access to airports and local transportation. Location is breathtaking, so much to do —the choices are endless! Meeting space allows many options especially with the sister property next door. Cancun, Mexico – January 2014 – JW Marriott Cancun Resort and Spa has been recognized among the top .25 percent of hotels in U.S., Canada, Mexico and the Caribbean as a AAA Five Diamond property for the eighth consecutive year. AAA ranks approximately 60,000 properties each year, bestowing only 179 properties, less than one percent, with the coveted Five Diamond Award. JW Marriott Cancun Resort and Spa is one of only 15 hotels in Mexico to earn the distinction this year. AAA’s professionally trained inspectors use published guidelines to evaluate lodgings and restaurants throughout the United States, Canada, Mexico and the Caribbean, rating them on a scale of one to five Diamonds, based on comfort, cleanliness, service and hospitality. The AAA Five Diamond Award is reserved for exemplary properties that reflect the ultimate in luxury and sophistication by delivering impeccable service and maintaining first class standards of excellence. Recipient of the coveted AAA Five Diamond Hotel Award, the landmark JW Marriott Cancun Resort & Spa offers an unforgettable Cancun vacation. Located in the heart of the hotel zone, each of the 448 well—appointed rooms have private balconies with stunning views of Cancun’s white sand beaches and the Caribbean. For those who wish to indulge themselves, the Club 91 accommodations combine the tranquility and sophistication of a private club with personalized and upgraded services. The JW’s Mayan--‐inspired spa is rated one of the top spas in Mexico and offers massages, body wraps, manicures, pedicures and more. With three world--‐class restaurants, 20,000 square feet of flexible meeting space and the stunning beauty of the Caribbean, the JW Marriott Cancun Resort & Spa is an ideal choice for corporate retreats, events and holiday vacations. For more information or to book a reservation, please visit www.jwmarriottcancun.com or call 1.800.223.6388.